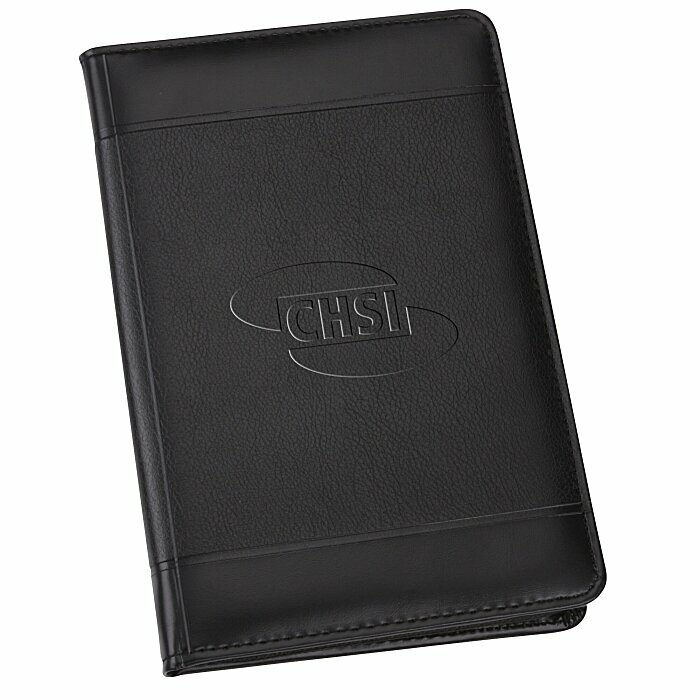 Convey a professional image with this padfolio! A polished appearance in the boardroom is just the impression you want to make, and this black writing pad helps you make it. The black portfolio opens to reveal a 30-page lined writing pad, elastic pen loop, one card pocket, and a document pocket to keep meeting supplies in order. The sturdy folder is made of sleek ultrahyde with textured sections on the front and back for added design. Zippers shut to secure padfolio contents. Size: 9-7/16" x 6-1/4" x 3/4". Your price includes a debossed imprint on the cover. Additional imprint areas available for an extra charge. Set-up charge: add $65 per location.